Say hello to inhuman business productivity: here comes the BlackBerry watch. 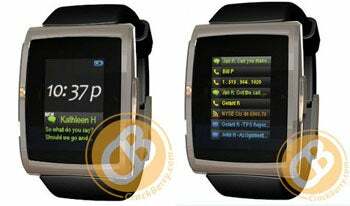 The BlackBerry watch is being created by Allerta for use with RIM's BlackBerry phones. CrackBerry.com stresses that the Bluetooth-connected inPulse SmartWatch (as it's being called at the moment) is not produced by BlackBerry, but rather it is a peripheral accessory. It's designed by a new BlackBerry-dedicated accessory company. It features an OLED screen for clearly visible text and solid battery life. It shows notifications and message previews. Pretty simple stuff, but the inPulse SmartWatch could prove mighty handy for fast-paced business junkies. The second a message comes through, you'll not only know it by the vibration of your phone; you'll see it lit up on your wrist. That mean you can discreetly keep track of what's happening back at the office during Thanksgiving dinner! The inPulse SmartWatch does not yet have a price or an availability date, but CrackBerry claims it's coming "soon." Story corrected 1/23/2013 at 4:30 p.m. to clarify the name of the maker of the inPulse.